Drawing on case studies from the telecommunications and auto industries, we argue that the vertical disintegration of major German employers is contributing to the disorganisation of Germany’s dual system of in-plant and sectoral negotiations. Subcontractors, subsidiaries, and temporary agencies often have no collective bargaining institutions, weaker firm-level agreements, or are covered by different sectoral agreements. As core employers move jobs to these firms, they introduce new organisational boundaries across the production chain and disrupt traditional bargaining structures. Worker representatives are developing new campaign approaches and using residual power at large firms to establish representation in new firms and sectors, but these have not been successful at re-building coordinated bargaining. © Wiley. Final version published as: Doellgast, V., & Greer, I. (2007). 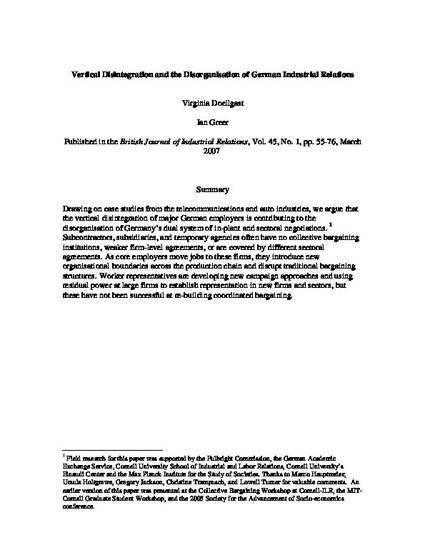 Vertical disintegration and the disorganisation of German industrial relations. British Journal of Industrial Relations, 45(1), 55-76.